Net Weight 27.3 lbs. / 12.38kg. Shipping Weight 30.8 lbs. / 13.97kg. Compliance Equivalent Vol. (Vas) 317.02 Liters/11.19cu. 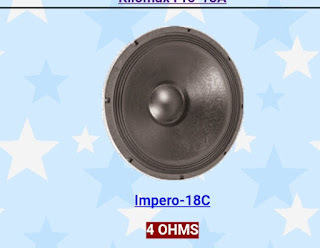 ft.
0 Response to "Speaker eminance 18inch EMINENCE IMPERO-18C - 18" 4 OHM SUBWOOFER"